Our Drive Through Secondary Spill Containment Berm allows for hands free drive in and out access without the risk of tearing the corners. In the event of a spill, the walls will rise automatically as the berm begins to fill up. 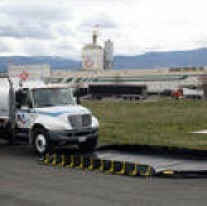 This drive through secondary spill containment berm is made with flexible side walls and takes only minutes to setup for very fast deployment. Easy cleaning and storage allows for repeated use. Includes a patch kit at no additional cost. The compact design takes very little space for storage. Please contact for a custom quote on a size that best fits your needs. Available options for this secondary containment berm include ground tarps and track mats. Available is various colors including black, desert tan and OD green. Pricing below does not in include ground tarps or track mats. Please contact us for accessory pricing. 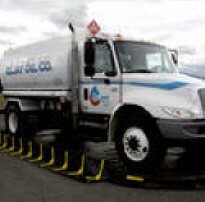 Meets US regulations for spill containment. End walls automatically rise when filled with fluid. Optional track mats prevent damage to berm. Custom Sizes are Available. 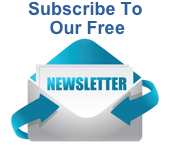 Please contact us by email or (800)869-9633 for a quote. 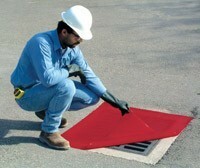 Click here for our Drain Cover Seals.